As June approaches, the USD community prepares to say goodbye to the G.O.A.T. and welcome a new university president. University President James Abbott announced his retirement Sept. 27. 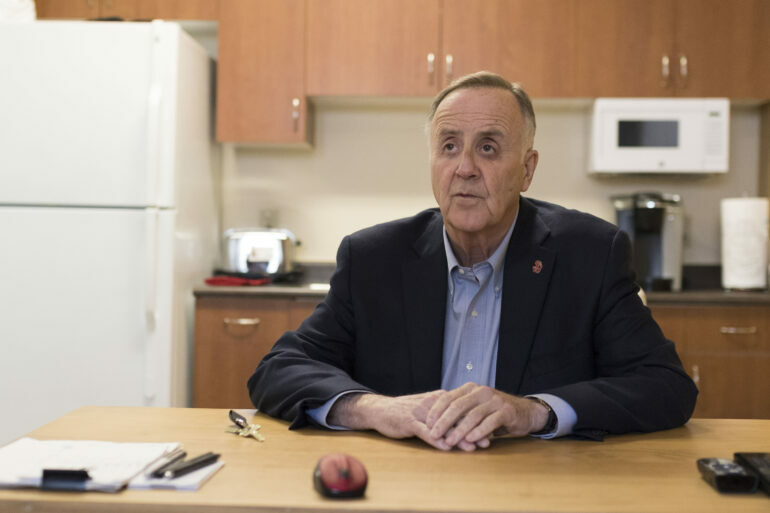 He’s served as USD’s president for 21 years. Abbott said some of his most memorable moments include the Women’s National Invitational Tournament win in the DakotaDome in 2016 and the student service on campus after 9/11. Commencement is another personal favorite of Abbott’s. He noted in his last state of the university address that he’s issued 35,148 degrees in 20 years at the job. “Every single year, every single commencement is a memorable day because it doesn’t make any difference on that day whether you’re first or you’re last, the fact is you are leaving here with a credential that you can use to be whatever you want to be,” he said. Abbott’s connection to students is evident in the conversations he has with tour groups to the times he lets students play with his dog, McGovern. He’s been interacting with students even more since moving into Coyote Village in February. Abbott said students need to be at the center of every decision made at the university. After retirement Abbott plans on vacationing for the first six months. Scott Pohlson, vice president of enrollment, marketing and university relations, started working for Abbott in 2009. He said he met him for the first time after he’d been on the job for a week. Pohlson said he’s loved working for Abbott. Lamont Sellers, associate vice president for diversity, said Abbott has done great things for inclusive excellence at USD. With the freedom Sellers said Abbott has given him, he forgets how things are done at other universities. “I just left a conference this past week and I was sitting with some colleges from some pretty prestigious institutions across the country, I’m talking about elite institutions, and I’m listening to their experiences with their leadership and I’m like, ‘I have nothing to complain about,'” he said. Sellers and Pohlson both said one of Abbott’s best qualities is the faith he has in his employees. Teagan McNary, former SGA president and a political science and criminal justice double major, said Abbott’s legacy at USD can’t be summed up into one word or even a phrase. The way Abbott interacts with students and acts on campus stands out to McNary, she said.